This award is named after Professor Nancy Millis, who served as Chancellor of La Trobe University for 14 years from 1992 - 2006. A 'legend' in the world of science, she was one of only five Australian scientists recognised on the 'Australian Legends' series of stamps in 2002. During her distinguished career, Professor Millis gained a string of scientific and civic accolades, including election to the Australian Academy of Science, an MBE and a Companion of the Order of Australia. The Nancy Millis Medal is awarded to the authors of outstanding doctoral theses. Examiners are asked if they consider the thesis to be in the top five per cent of theses they have examined. 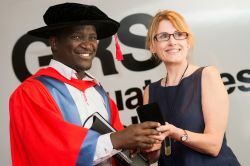 Nominated theses are then assessed following the examination process and are considered for award through a selection process that involves the School's Director of Graduate Research. Final recommendations are approved by the Board of Graduate Research. The following recipients received their award in 2018. The following recipients will receive their award at a special event, held at the Graduate Research School in December 2017. The following recipients received their award at a special event, held at the Graduate Research School in December 2016. The influence of organisational context in the practice implementation process: identifying influential aspects of design intent in an innovative therapeutic outreach program for child protection clients.